Down's Caolan Mooney gets a shot away despite the attentions of Conor Nevin at Celtic Park. Down's Conor Maginn gets away from Derry's Oisin Duffin in Celtic Park on Sunday. Down cast huge doubt of Derry's ability to retain their Division Two status with one sided demolition job at Celtic Park on Sunday. 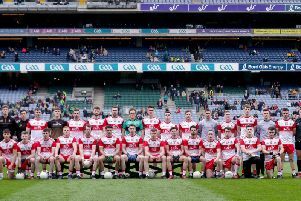 The Oak Leafers went into the game off the back of last week's superb victory over Kildare but were never at the races, allowing Down to all but wrap the game up by half-time by which stage Eamon Burns team had built an eight point lead which Derry never threatened in the second half. Derry did have a couple of early chances but looked bereft of confidence and very lethargic against a Down team for whom Kevin McKernan and full forward Barry O'Hagan were excellent alongside half-back Darragh O'Hanlon who score 0-4 in the opening 35 minutes. Just as in the McKenna Cup meeting earlier in the season, O'Hagan had Down in front inside the opening seconds, 13 to be exact, and it set the tone for a shocking opening quarter for the home side. With little or no resistance, Down ran riot. Caolan Mooney hit a brace of scores to put them three points up as Niall Loughlin and Carlus McWilliams passed up easy looking chances for Derry. O'Hanlon, with two frees, and O'Hagan with two more points of his own extended the lead to 0-7 to no score as Oak Leaf fans looked on in disbelief. But it was to get worse before it woudl improve. With 20 minutes on the clock and straightforward Down kick-out picked out McKernan, who turned and found the runner of his shoulder. That man was corner forward Ryan Johnston who couldn't believe the empty pitch in front of him and he proceeded to run through and hit the back of the net with an emphatic finish. That put Eamon Burns' side 10 points up but if Derry thought the storm had passed they were wrong as Joe Murphy, O'Hanlon and Maginn from the narrowest of angles amazingly left the visitors 13 points ahead with only 24 minutes gone. A short Kielt free found Conro McAtamney to finally get Derry on the scoreboard but the home crowd's reaction more than adequately illustrated their feelings on what they were seeing. To their credit though, Derry started to finally play and that opener was followed by Ryan Bell putting Emmett McGuckin in for a goal that breathed life into the Oak Leaf challenge. Down keeper did get his hand to the Magherafelt man's shot but couldn't keep it out and suddenly Derry had some momentum. A second McAtamney point and a lovely solo effort from McGuckin suddenly meant Derry had hit six scores in succession to narrow the gap to seven but Down and O'Hanlon had the final say of the half with a superb score and in truth Derry were lucky to be only eight points down at 1-03 to 1-11. Down began the second half with a distinctive possession based game but Derry's decision to continue to sit deep was difficult to understand given the deficit they were chasing. It took four minutes of the half before Down eventually ventured forward with Peter Turley being fouled and O'Hanlon extended the lead from the subsequent free. Benny Heron and James Kielt (free) brought the deficit back to eight points and Derry should have had a penalty when McGuckin - Derry's best player on the day - won a high ball and looked to be pulled by any one of two Down defenders. Ryan Johnston and Derry substitute Mark Craig swapped points but with the home team requiring goals it was always Down who looked more likely to get one. Derry had the appearance of a side that had accepted its fate, Down continuing to keep ball as they secured two points that could go a long way to securing Division Two football for next season while casting doubt on Derry's ability to do the same.